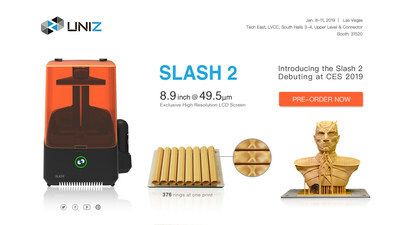 LAS VEGAS, Jan. 10, 2019 — (PRNewswire) — UNIZ, makers of the world's fastest 3D printers, has today announced their latest series of 3D printers: the SLASH 2 and SLASH 2J - are available to view at Tech East, LVCC, South Halls 3-4 Upper level, Booth #31520. The SLASH 2 series is not only some of the fastest 3D printers in the market with speeds of up to 1200 mm/hour, compared to the 3D printing industry average of 20-50mm/hour, but the printers also have a high accuracy of 49.5 and 32.8 microns. The SLASH 2 series also has an 8.9 inch high-resolution LCD screen and boasts 376 rings per print. The SLASH 2 series is perfect for applications in dentistry, jewelry, and custom manufacturing thanks to its high-precision printing. CES attendees can see the SLASH 2 printer and a variety of models that were printed from the series. The SLASH 2 series build volume is up to 3 times larger than that of other printers, allowing the printer to handle a wider variety of tasks and industry purposes. "UNIZ is proud to unveil the SLASH 2 series of 3D printers, an improvement on our first SLASH 3D printer that previously broke the record for highest 3D printing speed," said Jin Jiang Han, Marketing and Sales Director at UNIZ. "The Slash 2 series is an improvement in resolution, build area, precision and surface quality from our first model. We're excited about the possibilities our new series makes for widespread adoption of professional-quality 3D printers." Similar to other UNIZ products, the SLASH 2 is equipped with the same trademark cUDP technology that broke the 3D print speed record of up to 1200mm/hr. The new series garnered a large amount of attention from the trade show with its impressive display of quality and promise. The SLASH 2 series is scheduled to launch in H1 of 2019 with pricing details forthcoming. 7.5" × 4.7" × 7.9"
*Highest accuracy only achievable at integer multiples of smallest pixel sizes. **Not applicable to all geometries, cUDP specific design rules apply. Founded in 2014, UNIZ is a startup based in San Diego known for creating 3D printers of quality to make additive manufacturing technology affordable and easy for the individual. UNIZ is known for creating some of the fastest 3D printers, breaking records with their previous Slash Plus UDP at a speed of 1200 mm/hour. UNIZ's intellectual property includes more than 50 pending and granted patents and 20 proprietary materials. Clients of UNIZ include Northrop Grumman and Glidewell Laboratories.